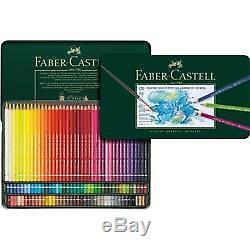 Faber-Castell 120 Tin Set Albrecht Durer Water Colour Set. Faber-Castell's Albrecht Durer Watercolor Pencils provide artists with great versatility of expression when drawing, shading and painting in watercolours. Rich pigments dissolve completely when blended with a wet brush. These high quality watercolour pencils are offered in 120 colours that are lightfast and can be reworked and lifted when water is reapplied, even after they have dried. The colours are matched to all other Faber-Castell lines. Choose from a variety assorted colour sets. We are proud to say that we have been serving artists of all levels since 1995. Our modest venture has grown into quite a large shop and now allows us to fulfill the needs of clients all over the world as well as locally here at home. We hope to spark your imagination and awaken the artist within you as our high-quality products inspire you to create and add some color to your life. If you happen to be local, please drop by and see us if you'd like. We are located at 42 Bridge Street Benalla, Vic, 3672. Our knowledge of Art supplies is very high and given out freely to help you achieve the best results possible in all aspects of art. All questions will be answered honestly. So come on in and browse our selection of top quality art supplies, crafts, stationary, and books. We are sure you will find something that invites your inner artist to come out and play! Be sure to stop by regularly to take advantage of our sales and specials that will help you save even more off of our everyday low prices. List, Sign up for our newsletters. Orders taken and posted up to 4.30pm. All products will be packaged to make sure they are safe for travel, and sent off via AusPost. We reserve the right to alter information at any time without notice. Carlisleart can't be held responsible for loss or damage of any kind, costs, third party claims resulting from the use of any product or information provided on this site. It is your responsibility to gather additional information on the use of a product, therefore we are not liable for injuries or health issues resulting directly or indirectly from any product use. Our policy lasts 30 days. To be eligible for a return, your item must be unused and in the same condition that you received it. It must also be in the original packaging. We also do not accept products that are intimate or sanitary goods, hazardous materials, or flammable liquids or gases. Any item not in its original condition, is damaged or missing parts for reasons not due to our error. Exchanges We only replace items if they are defective or damaged. Depending on where you live, the time it may take for your exchanged product to reach you, may vary. I will respond very quickly between the hours of 7am till 8pm each day. We pride ourselves on our feedback and believe all issues can be resolved. "The best compliment we can get from our customers is the word-of-mouth recommendation and the referral of your friends, family members and colleagues". The item "Faber-Castell 120 Tin Set Albrecht Durer Water Colour Set" is in sale since Thursday, September 14, 2017. This item is in the category "Crafts\Art Supplies\Drawing & Lettering Supplies\Art Pencils & Charcoal". The seller is "carlisleartau" and is located in Benalla, Vic, 3672.